In the town of Fenchester, seven resourceful children are yearning to be famous. One day, they come across a disused chapel, and an idea is formed. With a lick of paint and the addition of a beautiful curtain (which, however much they try, won't 'swish' as stage curtains ought), the chapel becomes a theatre - and The Blue Door Theatre Company is formed. 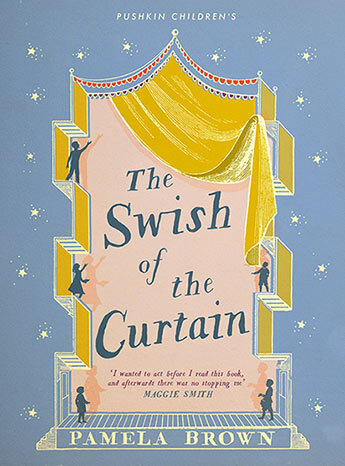 Written in 1941 when the author was just 14, The Swish of the Curtain is a classic of children's literature, and has inspired generations of children to go on stage. Pamela Brown (1924-1989) was a British writer, actor and television producer. She was just 14 when she started writing her first book, and the town of Fenchester in the book is inspired by her home town of Colchester. During the Second World War, she went to live in Wales, so The Swish of the Curtain was not published until 1941, when she was 16. She used the earnings from the books to train at RADA, and became an actor and a producer of children's television programmes.